Tired of replacing your Kitchen Sponge every week? Most of us let the cost of kitchen and cleaning sponges go unnoticed. But why settle for a low quality sponge that you have to replace frequently, when you can purchase a long-lasting, high quality and multi-purpose sponge? This 0.8 ounce-sponge is especially designed as an effective non-stick cleaning sponge, and is a must-have for every kitchen. But it does so much more than non-stick cookware cleaning! From your countertops, appliances and microwave to non-stick cookware, dishes, pots, pans, bakeware, glassware and plastic, this wonder-sponge is right for all! Sized at 4.75" x 3.5" x 1", it is perfect for gentle and abrasion-free cleaning. The top quality nylon mesh on one side gently aids in scrubbing any impurities off of a surface, while the terry-covered flip side provides extra-care for cleaning the most delicate items like silverware. Being dishwasher-safe, you can use this versatile sponge for months at a time. So put an end to your unnecessary kitchen-sponge expenditures and invest in a one-time high quality and multi-purpose flip sponge. Order your own pack today! LONG LASTING: Durable sponge quality even with repeated use. Wear-resistant nylon mesh and terry cloth outlasts months of washing. 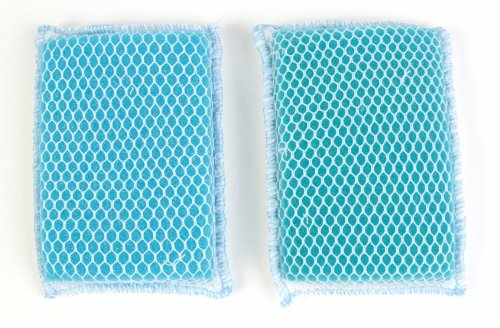 TWO-WAY CLEANING: Acts as nylon scrubber sponge on one side for gentle scrubbing, and terry cloth-gentle sponge on other the side is a Silverware Cleaner. CONVENIENT: Ideal size of 4.75" x 3.5" x 1" for easy cleaning, with excellent suds retention and sponge quality. MULTI-PURPOSE: Can be used as a dish washing sponge, non-stick cleaning sponge for chinaware, glassware, bakeware, pots, and pans as well as a non-abrasive sponge for delicate items like silverware. Also effective as a countertop cleaner, and cleaning sponge for bathroom. MACHINE WASHABLE: Resistant to machine washing and easily reusable for gentle and scratch-free cleaning.